Candy Block Puzzle is a classic yet innovative game.It's kindaanother variation of jigsaw.Very easy to learn and fun to master.HOW TO PLAY BLOCK PUZZLE: 1.Simply drag the candy blocks to movethem. 2.Create and crush full lines on the screen both verticallyand horizontally 3.Cross elimination create special rainbow candy.4.Blocks can’t be rotated.No color match. AMAZING CANDY BlOCKFEATURES: ★ Enchanting visual effects,Sweet Candy Pop! ★ It is allFREE and No Wifi Need! ★ Easy to play,and classic brick game forall ages! ★ Universal App looks great on phone and tablet ★ You canshare to your friends via Google+, Twitter, and Facebook Globalleaderboard available in this puzzle game and grab it now and beatplayers all over the world! No time limits, no color match! 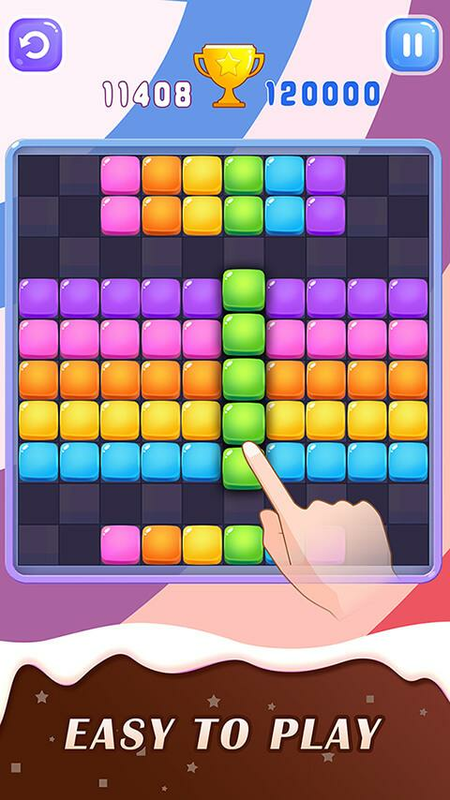 Fillall the grids with the matching blocks and enjoy this puzzle game!Crush the candy lines now! If you are a block puzzle mania,you willenjoy this game! The best choice of Mahjong game on Android! Match identical pairs,clear all the mahjongs, Enjoy it! Mahjong solitaire become one ofthe most popular board game all over the world. Simple rules andaddictive gameplay is great way to spend your free time. Play thereal Mahjong puzzle game. Match up traditional Mahjong tiles untilall of tiles are gone in this Shanghai style board game. HOW TOPLAY • Match and remove all mahjong tiles to complete a board!FEATURES ● Hundreds of immersive levels to challenge you! ●Beautiful and various layouts. ● Classic matching game play. ● Youcan play offline anytime. ● OPTIMIZED for ANDROID & GOOGLE PLAYGAMES. ● Designed for tablets & smartphones. ● utilize threegroundbreaking power-ups. ● Google Play game services support. ●Enjoy gorgeous graphics, rich sounds and regular free updates withnew levels, tile sets and more. More features you’ll treasure inMahjong Solitaire: - Taking advantage of innovative gameplay twistslike Shuffle, which allows you to get out of a difficult situation,or bomb, a tool for blowing up multiple pairs of tiles. - Mahjongis always there for you no matter where you are, whether at home,on the road, in a plane, or on a subway. - Mahjong is free to play,but you can purchase In-app items like power-ups. Classic mahjong +inventive extra challenges.Enjoy a new take in this addictiveMahjong Solitaire adventure! Download the best Mahjong game now! Sudoku by Joyo is the best puzzle game you can find for your phoneand tablet, and it'll help you to learn and improve your skills inthis classic sudoku game. Playing Sudoku on mobile is as good aswith a pencil and paper.Sudoku by Joyo will be the most beautiful,learnable, and user-friendly Sudoku game you’ve ever played, andit’s completely free!With our Sudoku app, not only will you play abeautiful user-friendly Sudoku, but you’ll also have access to theworld’s most friendly and complete mobile Sudoku learning system.Enjoy a clear, easy to read, and customizable Sudoku board withvisual guides that make glancing at the possibilities abreeze. Our input system is designed to make enteringsolutions and notes magically simple and our friendly scoringsystem allows you to compete with yourself or your friendsregardless of skill level. We created this innovative free gamewith several various key features: ★ The world’s most advancedSudoku learning tool ★ Career map to keep track of your gameprogress ★ More than 10000 masterfully crafted puzzles, all free ★Auto highlighted numbers for intelligent hint ★ Use pencil marks ★Auto Error-Checking Option ★ Advanced game options and notes ★Global leaderboard and achievement, which you can share or competewith your friends or others Get an amazing Sudoku experience: ★ Youcan share to your friends via Google+, Twitter, and Facebook ★Auto-save, you can pause at anytime you like without losing anyprogress ★ Selected cell highlighting ★ Incorrect digits mark ★Enchanting visual effects ★ Universal App looks great on phone andtablet ★ Give us feedback in the game, with your help we'll make itbetter We hope you will enjoy the stunning designs of our sudoku,and please contact our five star support if you have any questions:-) Thanks for playing! Archery Mania is a fun, challenging and addictive arcade game usinga bow and arrows. Pull & release rope to shoot an arrow.The faryou pull, powerful the shoot.Archery Mania have two game mode topractice your archery skill.Archery Mode:The game play is to shoota Target board with bow and arrow and make a great high score. DuckHunting:The goal of the game is to shoot the ducks. If you miss atarget duck or shoot a “Black Duck” you will lose 1 life and onceyou get three the game is over. Free to play Archery Mania now!Beat players all over the world! Fruit Link Deluxe is a very addictive and best match-2 casual gamein the google play!How to play:1. Connect two matching fruits usingthree or fewer straight lines.2. Archive the target in a limitedamount of time.3. Eliminate the fruit pairs quickly can make combosand get extra scores.Fruit Link Deluxe features:1. More than 1000challenging levels & many game props.2. The Bomb props caneliminate one kind of fruits.3. The Refresh props can refresh allthe fruits.4. The Find props can crush one pair of connectedfruits.5. Sweet and delicious UI & cool animation effects.6. 4different game modes(all free)Splash the fruits! Free To Play TastyFruit Link Deluxe Now! Sudoku 2 by Joyo is the best sudoku puzzle game you can find foryour phone and tablet, and it'll help you to learn and improve yourskills in this classic sudoku game. Playing Sudoku on mobile is asgood as with a pencil and paper.Sudoku 2 by Joyo will be the mostbeautiful, learnable, and user-friendly Sudoku game you’ve everplayed, and it’s completely free!With our Sudoku app, not only willyou play a beautiful user-friendly Sudoku, but you’ll also haveaccess to the world’s most friendly and complete mobile Sudokulearning system. Enjoy a clear, easy to read, and customizableSudoku board with visual guides that make glancing at thepossibilities a breeze. Our input system is designed to makeentering solutions and notes magically simple and our friendlyscoring system allows you to compete with yourself or your friendsregardless of skill level. We created this innovative free gamewith several various key features: ★ The world’s most advancedSudoku learning tool ★ The hints not only give you the answer butexplain why the answer is what it is ★ 4 perfectly balanced levelsof difficulty: easy, medium, hard and expert ★ Auto highlightednumbers for intelligent hint ★ Use pencil marks ★ Endlesscollection of masterfully crafted puzzles ★ Advanced game optionsand notes ★ Global leaderboard and achievement, which you can shareor compete with your friends or others Get an amazing Sudokuexperience: ★ You can share to your friends via Google+, Twitter,and Facebook ★ Auto-save, you can pause at anytime you like withoutlosing any progress ★ Selected cell highlighting ★ Incorrect digitsmark ★ Enchanting visual effects ★ Universal App looks great onphone and tablet ★ Give us feedback in the game, with your helpwe'll make it better We hope you will enjoy the stunning designs ofour sudoku, and please contact our five star support if you haveany questions :-) Thanks for playing! Find The Difference (Spot the difference) is a FREE puzzle andcasual game that will allow you to relax and to get pleasure fromfinding objects on beautiful images! Try our find the differencesand enjoy beautiful images in a classic puzzle game, training andrelaxing your brain for hours and hours. It's quite similar to thehidden object game. Try our free game find the differences 300levels, a very exciting and classic game know as "Spot thedifferences", "Find the differences", "Game Differences", or "Spotit" where you have to find and spot five hidden differences betweentwo similar HD pictures before the timer runs out. HOW TO PLAY FINDGAMES: “Compare two pictures side by side” to search fordifferences; When you “find the different object”, tap on it asfast as possible! AMAZING FIND IT FEATURES: ★ More levels thanother games ★ It is all FREE and No Wifi Need! ★ Amazing HDpictures ★ 5 differences in each picture ★ Optimized for phones andtablets ★ Informing about new levels ★ On/Off music and sounds(relaxing and beauiful music) ★ Renewable hints and More Time Propswill help you if you get stuck in this colorful world ofdifferences. ★ All the differences and the hidden objects areoptimized for a normal game - you don't have to find a small pointor a small block of pixels, independently mobile phone or tablet isused. ★ Large variety of the backgrounds themes: landscapes,nature, cars, buildings and even beautiful girls can be met by youon the expanses of searching for differences. We tried to selectfor you the most beautiful, cool and live photos. Our FindDifferences game is already loved by both children and adults, bothgirls and boys, both men and women.Put our "Spot different game" onthe 'shelf' where you store your favorite and useful apps and yourcollection will become more complete. If you like playing mysterygames, puzzle games, and other educational games, this memorybooster will bring you numerous benefits! “Find the differences” isa free brain teaser which will help you enhance your observationskills in a second. “Find the difference free” is the best guessdifference game for kids and for adults and both genders will loveit.Free download Find the Difference and enjoy finding differencesin cute pictures! “Find the differences games” are excellent forplaying in a pair – play these “spot it games free” with yourfriend or your special someone! We guarantee you hours of fun andentertainment with these “find the differences games”! Somedifferences are very easy to find, but some are very mysterious.Enjoy playing the best “find differences” game ever and comparepictures side by side! Download the best guessing games and startplaying today! Difference games that you will adore! Are you readyto “spot the difference” today!Find differences as quickly as youcan and recommend these “spot games” to all your friends! If you'relooking for concentration games which will help you develop yourability for noticing details, these learning games to find thedifference are waiting for you! Spot the difference in pictures andunlock new levels! Majestic design will sweep you off your feet!Free difference games only for you! Download “Find the Difference”and see what we're talking about! Find the difference games withexcellent graphics! Buckle up and prepare for the best spot thedifference ride! Spot the difference free games straight from ourfactory of the best mystery games on the market!Get ready for abest photo hunt of your life and join to our team of lovers of"Find the differences" and puzzle games! Enjoy Find the Differencepuzzle game! Stay like a king of the differences - conquer all thelevels! Download Spot the Difference and share it with everyone! Enjoy jewel: best retro quadris classic puzzle game. And jewelpuzzle is one of the best android games that you can see. In thisclassic game, you don't have to use navigation controls given belowthe screen like, Right, Left, Up and Down such as other retroclassic games. You only need put blocks in blank to make full rowor column and block brick it to point up and take Top 1 Online:jewel Puzzle Games: Block Brick Free With FriendsHow to play - Dragthe blocks puzzle jewel to breakout. - Put blocks all in the row orcolumn, the blocks will be clear automatic and you get more points.- If you can't arrange more, you should see video appear after todrop 4 row and you can continue play. - Gameover when you can'tarrange more after two video ads you've seen. FEATURES - Simplerules and Easy control - Many new nice cubes - Attractive effectsand easy controls - Queue in Top everyday, every week and month andyou can get many valuable gift from Game developer - Feedbackquickly for usersAfter 6 months of hard work with more than 20employees in many positions: programming, design, marketing ... wehave launched this attractive game. Although it has been thoroughlytested, there will be somethings that you feel are not reallysatisfied because we can not understand all of your culture andhobbies. Anything you do not like, please comment us, we willrespond immediately and make you feel more comfortable playing. *Our fanpage: https://www.facebook.com/imogamestudio/* Our Facebookgroup: https://www.facebook.com/groups/1416440891746915Let installour games and play with your friends, i promise you will satisfied.Let to jewel Puzzle Games: Block Brick Free With Friends now! Block Puzzle is the world's most famous puzzle game. Game Features- Block preview is available until stage 10. - Please enjoy thegame against all the world users in the P v P support. - The optionsupports key layout for the three modes. - There are variousachievements. Complete your achievements. - This is a tetrominoblock game. The goal is to drop blocks in order to create and destroy fulllines on the screen both vertically and horizontally. Simply Dragthe blocks, and fill up all grids this addictive puzzle game BlockPuzzle JewelsFrom now on, let's enjoy a simple and addictive puzzlegame! Once you start, you'll be hooked.You can play Block PuzzleJewels games for FREE.